Ruinart, the oldest Champagne house (established in 1729), produces an intensely flavorful, powerful rosé that seems to benefit from those centuries of experience. 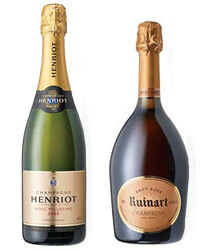 In 2002, Henriot, a leading small Champagne house, created this complex rosé: It combines deep earthiness with creamy, delicate berry notes. Though it's a private company, Feuillatte is closely tied to Champagne's largest union of vineyard owners—giving it access to nearly 5,000 acres of vineyards spread throughout the region. Cellarmaster Jean-Pierre Vincent uses a high percentage of Pinot Noir (about 60 percent) to give this robust, strawberry-scented rosé its emphatic character. This graceful, bronzy-orange rosé seems the antithesis of Mumm’s somewhat clunky but very well-known Cordon Rouge bottling: It’s full of delicate red cherry flavors, with a light, appealing scent of aromatic herbs. Geoffroy is a grower Champagne, meaning that all the grapes come from a single estate (most major Champagne houses source grapes from hundreds or even thousands of small growers). This deeply colored, earthy, rich rosé is made by the uncommon saignée method, in which juice is drawn off from the crushed red grapes (Pinot Noir, for this wine) after a short maceration. Pommery, known for the ancient Roman chalk mines in which it ages its wines, makes a classic rosé, combining power and delicacy in equal proportion—it seems to send up notes of toasted brioche and wild berries along with its effervescent bubbles. Gosset, which is one of the smallest of the major Champagne houses, is known for its elegant, precise style. That refined character comes through distinctly in this Chardonnay-dominated (58 percent) rosé Champagne, with its microscopic bubbles and exotic wild berry flavors. Vintage Champagnes are produced only in the very best years. Hailstorms in Champagne during the summer made the 2000 vintage a stress-inducing one for vineyard owners, but in the end, perfect weather during autumn resulted in superb wines. This powerful, savory rosé—a blend of 57 percent Pinot Noir, 32 percent Chardonnay and 11 percent Pinot Meunier—is a good example. Pol Roger, founded in Épernay in 1849, is unusual for a major Champagne house in that it makes a substantial amount of its wine—almost 45 percent—from its estate vineyards. It’s also unusual in that it remains family-owned (most of the big brands are owned by giant corporations). It’s hard to say whether that contributes to the quality of Pol Roger’s wines, but as this pink-gold, wild berry–scented rosé shows, the bar is set very high. Proposing? Apologizing (in a big way)? Consider Bollinger's complex, powerful tête-de-cuvée rosé. Unlike most houses, Bollinger ferments its base wines in old oak casks, which helps give its Champagnes an impressive richness and textural depth. Admittedly, this bottling is very expensive—but with its luscious depth of flavor, perfect balance and heady scent, it’s truly worth the hefty price tag.